TFI Envision works with Building One Community on Immigrant Rights Informational Materials | TFI Envision, Inc.
Stamford, CT — In October 2018, Building One Community™ – The Center for Immigrant Opportunity hosted a panel discussion on immigrant rights. The discussion was led by Glenn Formica, experienced trial lawyer and immigration practitioner, and Kica Matos, the Director of Immigrant Rights and Racial Justice at the Center for Community Change. The panelists explained community support and effective community activism, highlighting cases in which the team support model implemented by Building One Community™ was effective. 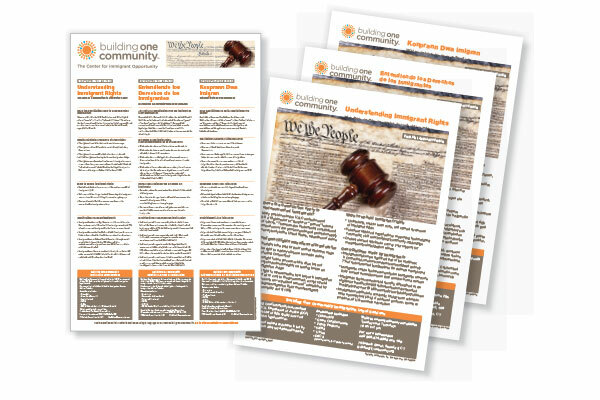 “After attending this informative and timely event, I reached out to Catalina Horak, Director of Building One Community, and offered TFI Envision, Inc.’s creative services to create Building One Community™ branded information flyers in English, Spanish and Haitian as well as a 24” x 36” trilingual poster that could be used as both an educational tool for immigration rights and language. We had worked with Catalina and her team on the renaming and rebranding of Building One Community™ in 2016 . This felt like a great opportunity for us to help get this information out to the public since there has been so much misinformation about immigrant rights.” said Elizabeth P. Ball, President and Creative Director of TFI Envision, Inc.